Once it seemed like an inexorably rising youth movement calling out the sham of a “semi-autonomous” democracy manipulated by Beijing, but China’s crackdown against the movement appears to have worn it down, its leaders jailed or blacklisted from participation in politics. 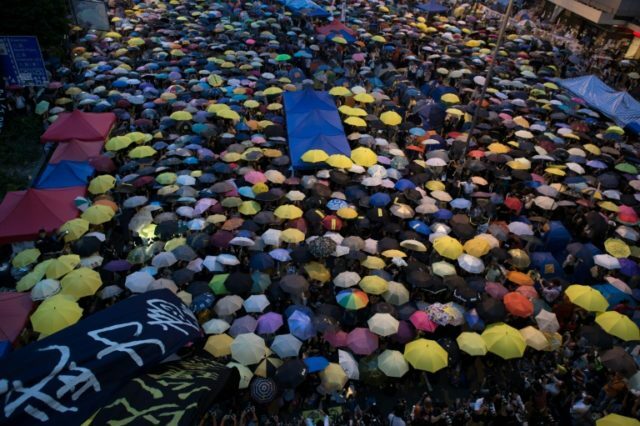 Apprehension about Chinese control remains strong enough in Hong Kong to produce sizable rallies in honor of the umbrella-toting activists who shut down the city and stunned the world in 2014, but activists now speak more of keeping the guttering flame of democracy alive than igniting a revolutionary blaze. For some in Hong Kong who dislike Chinese rule, it is a matter of changing tactics as strategic futility sets in. Beijing clearly sent a message that independence will never be permitted, and “secessionists” will be crushed by any means necessary, so many opposition voters are thinking more about working within the China-dominated system than agitating for a declaration of independence that will never happen. “Confronting Beijing directly is not a good strategy. You have to go about it in softer ways,” one democracy supporter who voted for a pro-Beijing candidate in the last election told Reuters. China has grown increasingly bold about infringing on Hong Kong’s autonomy and knocking out political candidates it finds unacceptable. The latest flexing of Chinese muscle concerns a law professor at the University of Hong Kong named Benny Tai Yiu-ting, who attended a forum in Taiwan last month and suggested that Hong Kong could “consider becoming an independent state” someday as China itself becomes more democratic and transitions into a federalist system similar to the European Union. Professor Tai came under intense attack by pro-Beijing forces in Hong Kong who questioned his political loyalty, his fitness to teach, and even his mental stability. Tai believes he is being kept under surveillance by unknown law enforcement or spy agencies who wish to intimidate him into silence. He believes that because someone leaked creepy surveillance photos of him to a pro-Beijing newspaper in Hong Kong. Tai posted a Facebook message on Tuesday in which he told supporters to assume he has been kidnapped if he turns up in mainland China or Macau “If you see me on videos saying I returned voluntarily, I would have definitely done so under pressure or coercion,” he wrote. The Global Times sneered that Tai is a “so-called law professor” and denounced him as a “separatist” who abuses “freedom of speech” as an excuse for flaunting the law. It warned he will ultimately be dealt with by Beijing if Hong Kong doesn’t take care of him. “If time proves that Hong Kong has no intention or capability to enact Article 23, the city should be prepared for the central government, shouldering ultimate responsibility for China’s national sovereignty and security, to intervene and take corresponding measures,” the Global Times warned. The editorial added that Hong Kong should also step up its efforts to teach children proper loyalty to Beijing in school because “education is of vital importance to eradicate pro-independence forces at the root.” The tyrants of Beijing denounced Tai as unfit to teach at Hong Kong University and demanded his immediate sacking. The university, however, insisted as recently as Tuesday that Tai has not violated any of its standards or protocols with his off-campus remarks, and said no formal complaint has actually been filed against him, despite the outcry from Beijing and its loyalists in Hong Kong. Legal authorities in Hong Kong likewise said the professor has committed no crime, while two dozen lawmakers issued a joint statement vowing to protect his freedom of speech. Another grim milestone mentioned in Reuters’ look at the state of the Hong Kong democracy movement is China’s systematic campaign against booksellers who deal in banned books, which was the subject of an extensive New York Times piece on Tuesday. The booksellers had been doing brisk business slipping blacklisted works into mainland China, using such techniques as hiding them under fake dust covers. Business picked up after the Tiananmen Square atrocity in 1989, as the Chinese government attempted to erase the Tiananmen protests from history, and books about it became hot underground items. Some Chinese politicians got in on the act, using Hong Kong’s publishing industry to leak information, spread gossip, and criticize their opponents in terms that would not be permitted in China. The New York Times mentions that many popular underground titles were filled with salacious gossip about Chinese President Xi Jinping. Beginning about two years ago, Chinese authorities suddenly began cracking down hard against book smuggling. Some of the booksellers were harassed and intimidated, while others simply disappeared. Meanwhile, Beijing began pressuring Hong Kong to compromise its tradition protection for free speech and start banning books on mainland China’s blacklist. The once-thriving underground book market all but disappeared, with a speed that stunned dealers and publishers. Some of Hong Kong’s democracy leaders remain defiant or even optimistic, but they face a well-funded and well-organized pro-Beijing bloc that has convinced many voters it is futile or dangerous to vote for independence-minded representatives. The best recent news for democracy activists was a Hong Kong court rejecting China’s bid to disqualify democratic lawmaker Au Nok-hin after his election on March 11, ending a streak of six successful Chinese moves to unseat legislators seen as friendly to independence. However, there are fears the pro-Beijing bloc could make another run at Au and unseat him with a better-crafted lawsuit. The offense that is supposed to disqualify him from holding office is that he burned a copy of the Basic Law that makes Hong Kong subordinate to China at a rally in 2016.